An organized maze of more than 80 exhibits, 10 golf club manufacturers and thousands of golfers filled the 60,000 square-foot Overland Park Exhibit Center Sunday, February 24, 2013. 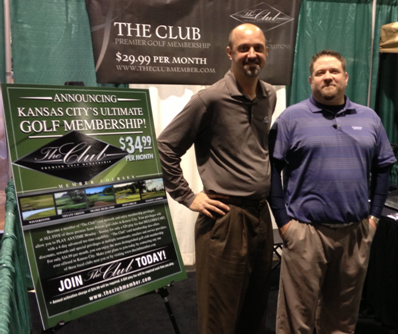 Varsity Communications is in its second year of owning and running the Kansas City Golf Show. With their reputation of being one of the nations largest and most respected producers of high-end consumer expos, they gave this year’s attendees their money’s worth. The Kansas City Putting Championship, sponsored by Hendrick Buick GMC Cadillac, was in full force Sunday afternoon with the champion winning the grand prize ‘Stay & Play’ at Prairie Band Resort & Casino. The top 20 become eligible to win a new Cadillac at the Midwest Classic held July 15-21, 2013. 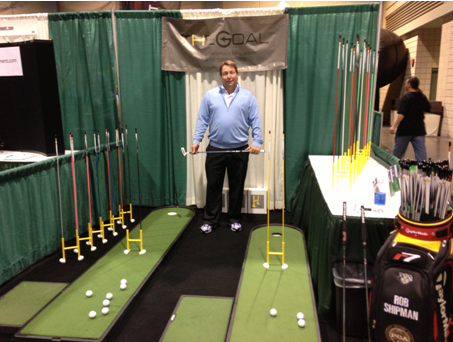 Golfers who visited Rob Shipman’s booth are sure to be better putters this year with The Goal. His recent invention, recently voted as one of the Top-10 products at this year’s PGA Golf Show, will increase percentage of putts made with a simple approach – putt alignment. To learn more about The Goal visit Shipman’s website located at www.thegoalofputting.com. 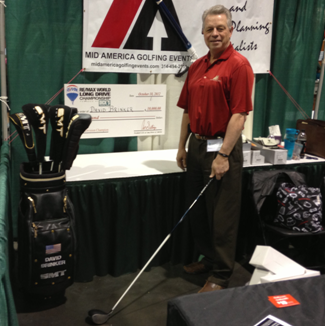 And not too far from Shipman’s booth was David Brinker, president of Mid-America golfing Events (MAGE). Brinker won the 2012 RE/MAX World Long Drive Championship in the Legends Division (age 60+) with a drive of 330 yards. He is proof that being good takes patience and commitment. This was his first win in his 9-year association with the premiere event in golf power. More about Brinker, and his tournament and charity services can be found on his website at www.midamericagolfingevents.com. He helped raise more than $1.5 million for charities in 2012, like Juvenile Diabetes Foundation, Junior Achievement and Ronald McDonald House, to name a few. Opportunities on how to become a better golfer were around every corner, including the PGA Junior Zone for kids. This area focused on introducing younger generations to the game of golf, and it was a big hit. Kids were laughing and enjoyed picking up golf clubs, swinging them and sometimes connecting well with a golf ball. Adults turned kid-like too, as they wondered around peaking into booths trying to find the next big thing to add to their game. 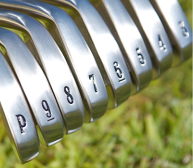 Nobody found the magic pill for the perfect golf swing, but many found teaching aids and instruction, deals on golf clothes and clubs, and specials on rounds of golf throughout the 60,000 square feet space of golf madness in February. Golfers who visited the Alvamar Golf Course booth received a token of appreciation by receiving a free foursome – cart fee not included. Brian Minnis, director of operations, said, “Kansas City golfers have a lot of great courses to choose from in the metro area. Alvamar is basically part of the metro, and we are giving Kansas City golfers an opportunity to experience what we have to offer at Alvamar.” www.alvamar.com. More in the heart of Kansas City, and in the center of the golf show, is Deer Creek Golf Club; a 72-par course with all new greens. Jeff Miller, general manager, and some of his staff provided attendees incentives to play their Robert Trent Jones, Jr. designed course. www.deercreekgc.com. Voted 2013s Golfweek’s Best Resort courses is Firekeeper Golf Course. Randy Towner, general manager, sported a booth with a feel of the Prairie Band Potawatomi Nation – one of the hottest golf destination properties in the Midwest. www.firekeepergolf.com. The Kansas City Golf Show show opened it’s doors Friday, February 22 and the last golfer left the show Sunday, February 24. There was something for everyone to enjoy, and it gave attendees a window to briefly look through and see the game gearing up for an exciting 2013 season of golf.